Our networked world is already influencing the design of tomorrow’s homes. Thanks to state-of-the art digital technologies, more and more functions in the home can be controlled via remote control or apps without the user being anywhere near the device or having to lift a finger. Close the blinds, switch on the light, adjust the heating or start up the coffee maker – all these things can be programmed or controlled by tapping a digital device. On the occasion of LivingInteriors 2016, Koelnmesse has joined forces with numerous renowned brands and the government of North Rhine-Westphalia to present the Smart Home Project, which showcases examples of the new intelligent home. GROHE, the world’s leading supplier of water faucets and fittings, has joined the project as the bathroom and kitchen fittings partner. 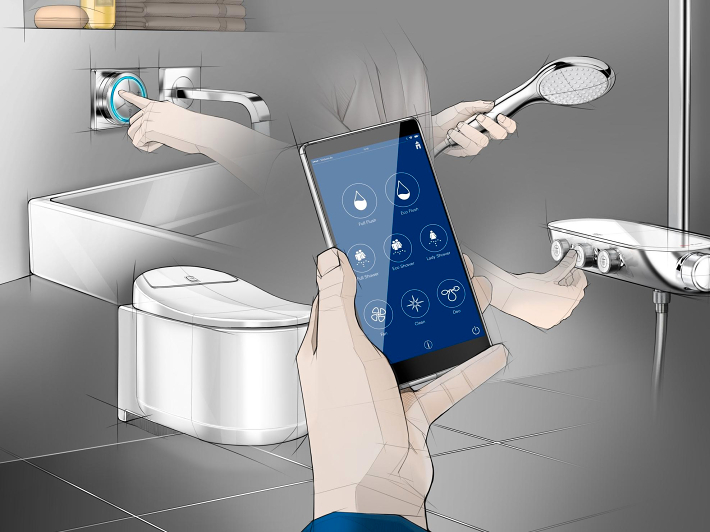 The Smart Home showcase staged during imm cologne from 18 to 24 January 2016 in Hall 4.2 lays out the basic structure of a digitally networked home. Apart from GROHE, renowned brands such as Vodafone, BMW, Miele and Nolte Küchen will equip the various rooms and outdoor areas of the house. They will present the latest digital and smart production solutions such as technical and design-oriented facilities, household devices and infrastructure and provide an informative outlook on tomorrow’s home – a home where different technologies work together to offer residents maximum comfort. Experts will be available throughout the show to supply information about the products and technologies presented, answer questions and conduct live demonstrations of the devices. GROHE is the project partner for the bathroom. Visitors to the show will have the chance to experience Sensia® Arena, the new design-oriented shower WC from GROHE, which offers the best combination of features currently available in shower WCs. The refreshing power of water can be remotely controlled for superior comfort, cleanliness and hygiene. The Smart Home bathroom additionally features Allure F-digital faucets whose digital controllers include a memory function for users’ preferred settings. The shower is equipped with GROHE Smart Control, which is characterised by innovative push button technology. The thermostat faucet combines a futuristic look with playful interaction for a personalised shower experience. The integrated water saving function helps users manage their water usage, thereby meeting all demands made on a truly sustainable product. Apart from the bathroom, GROHE products can also be found in the kitchen, where the Minta Touch hybrid faucet combines two types of operation, namely by skin contact thanks to EasyTouch technology and conventional lever operation. This makes the faucet not only especially hygienic and practical but also economical. LivingInteriors marks the kick-off of the Smart Home Project, which is designed to run for a period of initially five years. During this time, the showcase will regularly be presented at various events relating to technology and living. This concept home addresses many different target groups and offers consumers as well as architects, planners and media representatives exciting insights into the digital networking options for individuals, society and the economy.